Review the registration rates and policies below. Cancellations will be permitted on early registrations only, subject to a $50 processing charge, with written requests received prior to July 22, 2019. Substitutions are permitted up to July 22, 2019. No refunds will be issued after July 22, 2019. Returned checks are subject to a $50 service charge. Unregistered guests may attend meals and special events by purchasing tickets with a registered delegate. Only registered delegates may attend plenaries and sessions. A confirmation of registration will be sent via email as registrations are processed. If you have not received a confirmation notice within two weeks of submitting your registration, please contact us by email at [email protected]. 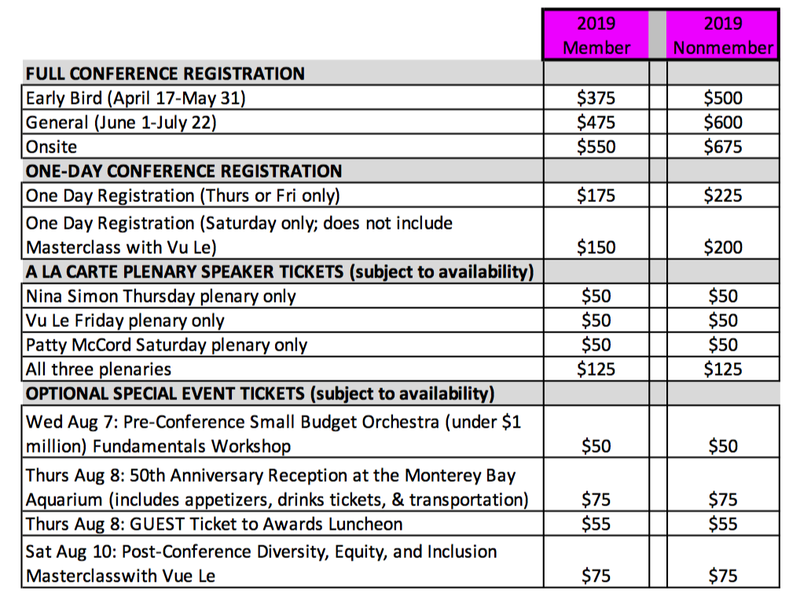 If your organization is bringing five or more people to Conference, you are eligible for a 15% discount on all full conference registrations. Contact us at [email protected] for personalized service. This discount cannot be combined with any other offer. The deadline for group registration is July 22, 2019. Registrants cannot purchase more than one one-day registration. This discount cannot be combined with any other offer. Member orchestras may send one musician free of charge. This offer is to encourage participation of musicians; it is not for conductors or musicians who serve on your Board of Directors/fulfill other staff duties. The musician with free entry must accompany a paid delegate from his/her organization. Offer covers three-day registration only, as all ticketed events must be paid for in full. You must contact us at [email protected] to register. The deadline for musician registration is July 22, 2019. ACSO business members and business sponsors may exhibit in the Exhibit Marketplace free of charge. A $700 exhibitor fee applies to artists, artist managers, or vendors who are not current ACSO business members or corporate sponsors. Contact us at [email protected] to exhibit in the Exhibit Marketplace or to become a Business Member.